Can Chelsea’s new signing Gonzalo Higuaín help improve Eden Hazard’s poor FPL returns of late? It’s all aboard the Manchester United train once again ahead of Gameweek 24, with two particular assets from Old Trafford proving too good to resist. While ownership levels of Solskjaer’s rejuvenated stars continue to climb, it’s so long, farewell, auf wiedersehen, goodbye to two former FPL favourites, who’ve been decidedly off-colour in recent weeks. So, without further ado, here are my thoughts on all the key transfer activity so far, as we gallop towards Gameweek 24. As always, I wish all of you the very best of luck. Paul Pogba’s popularity resurgence continues ahead of Manchester United’s Gameweek 24 clash with Burnley at Old Trafford. Ole Gunnar Solskjaer’s side can’t stop winning at the moment, and with 7 goal contributions (5 goals, 2 assists) in his last 5 appearances, it’s easy to see why a further 180,000 FPL bosses and counting have added the Frenchman to their ranks – how can you not? The former Juventus man is now owned by 40% of FPL bosses, who are reaping great rewards for their £8.7m outlay. You simply can’t get any better for that sort of money. Pogba’s United team-mate Marcus Rashford has also turned in some stellar performances since the arrival of Ole Gunnar Solskjaer. And, like Pogba, he’s also an absolute bargain – and a further 227,000 FPL bosses have added the England forward to their ranks ahead of Gameweek 24. We’ve been saying for a several weeks now that Rashford has the potential to become a ‘must-own’ if only he could add some consistency to his game – and with 6 goals in his last 8 including 4 in his last 4, he’s done just that. At £7.7m, it’s borderline negligence to ignore Rashford ahead of Gameweek 24’s fixture against Burnley. What’s more, with games against Leicester and Fulham to follow, things could get even better. It was around this time last year when Richarlison’s form dipped quite drastically, and it remained that way for the rest of the season. The last few Gameweeks suggest that history could be repeating itself here. Despite Everton facing a very winnable looking fixture against rock-bottom Huddersfield in Gameweek 24, over 132,000 FPL bosses have lost patience with the Brazilian after no notable returns in 4 Gameweeks. If you’re wildcarding or you’ve got several free transfers to play with, this probably isn’t a bad idea – but if you’ve got no money in the bank and you’re looking for a like-for-like replacement, it’s incredibly slim pickings. As a Richarlison owner (and a quite frustrated one at that) no adequate replacements are jumping out at me, so I’ll be hedging my bets that he can end his barren run against the Terriers. With so many cheaper options in such good form, you’d be bonkers to continue to allow Eden Hazard to take up £11.0m of your budget., right? Despite that he features in about 1 in 3 FPL squads, over 172,00 of you have seen enough ahead of Chelsea’s Gameweek 24 trip to Bournemouth – making the Belgian by far and away the most transferred out player so far. With just one assist in the last 4 Gameweeks, it’s impossible to make a credible case for owning him. Leroy Sane plus £1.3m in the bank, anyone? With Chelsea’s new signing, Gonzalo Higuaín likely to start against Bournemouth in Gameweek 24, I can see why some FPL bosses will give Hazard a few more weeks to prove his worth and I hope it works out for you. 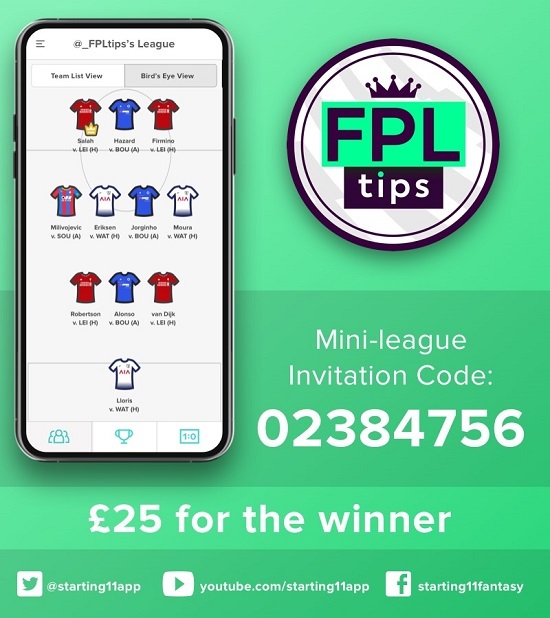 BEFORE YOU GO… We’ll be giving away £25.00 in cash to the winner of FPLTips’ WEDNESDAY ONLY Mini League on Starting 11 this week. Simply download the free app below and create your best 11-man team for WEDNESDAY’S 4 Premier League games – oh, and you’ll need to pick a captain.